Some US anti-fracking activists are taking a physical approach to opposing fracking. Community-based action has also been reported in Australia. EF! Blockade at Momentive facility, NC, July 8 2013. Credit: Croatan Earth First!. The following text is from a press release of the newly-formed Earth First! Media office, which provides correspondence to news outlets around the world. Raleigh, NC—Earlier this month, activists with Earth First!blockaded the North Carolina facility of a company involved in hydrofracking for oil and gas. According to Earth First!, this action is the start of a coordinated effort to target businesses involved with the controversial fracking industry. Following this action by Croatan Earth First!—a group based in central North Carolina—a new online resource, FrackIndustry.org, was also launched. The website provides detailed information, including addresses of offices and facilities operated by companies such as Carbo Ceramics, US Silica, Rainbow Ceramics, Northern Frac Proppants, andMomentive, the target of this month’s blockade in Morganton, N.C.
Croatan Earth First! says Momentive is a prime example, being one of the largest worldwide distributors of “resin coated proppants,”a necessary component for fracking. Each stage of the industrial process requires approximately 136 tons of the proppants. Fracking, or Hydraulic Fracturing, has repeatedly been shown to poison ground water, first by pumping huge volumes of water mixed with toxic chemicals deep into the earth to fracture rock releasing oil and gas, and again by deep-well injecting the remaining waste. Fracking has also been linked by experts to recent earthquakes in Ohio, Arkansas and Texas. 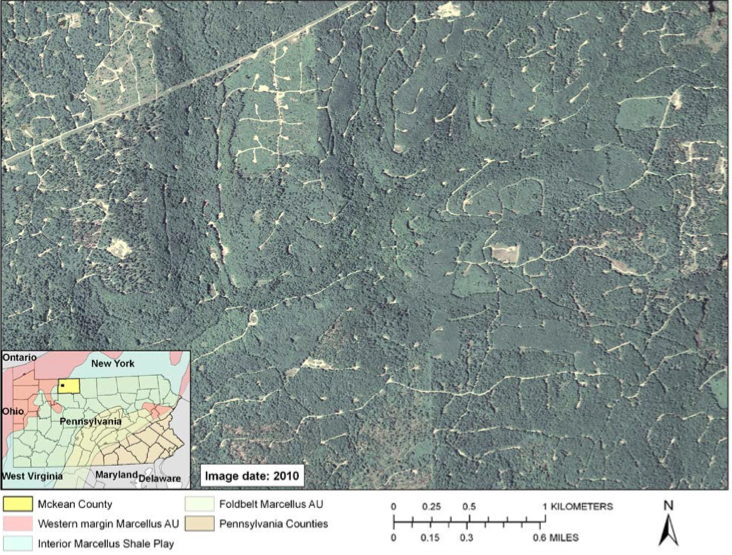 A photograph from a recent report issued by the U.S. Geological Survey illustrates the degree of damage done to forest land in Pennsylvania by natural gas drilling activity. The report found that natural gas driling activity is a primary force behind the destruction of Pennsylvania forest land. Along with these impacts to human communities, studies by agencies such as the US Geological Survey have shown that this method of fossil fuel extraction is also fragmenting wild habitat wherever it goes. For example, the mature forests of the eastern US which are only now recovering from a century of industrialism that drove animals, from migratory songbirds and to top predators, into near-extinction. “These companies are poisoning us for profit and getting support from the Obama Administration to do it. If we truly have the right to defend ourselves, that means we have to disrupt the chain of supply for fracking by any means necessary,” said Lydia Nickles, a Croatan Earth First! Organizer from North Carolina. Along with multiple locations across North Carolina, the target list includes office addresses in most states across the country. There are also international locations around the world, including China, Canada, Brazil, Mexico, Australia, UK, Spain, Germany, France, Finland and Turkey. Last Year Earth First! 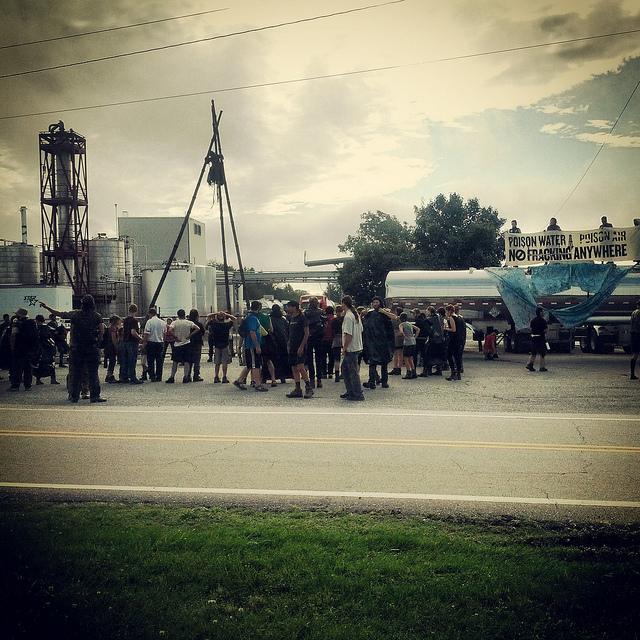 activists carried out a large anti-fracking blockade at a drilling site in Pennsylvania. A month later unrelated sabotage at another fracking site in P.A.wasreported to have caused $120,000 in damages. In October 2012, equipment at the building site of a compressor station for fracked gas in Orange County, N.Y., was also reportedly sabotaged and stolen. 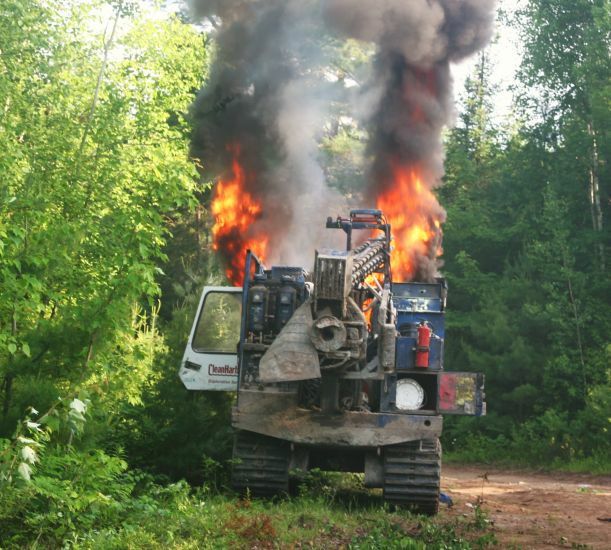 A similar style of resistance to fracking is under way this summer on First Nations land in New Brunswick, Canada, where fracking equipment was set on fire, amidst a campaign of protests and blockades. He is referring to a CNBC report in 2011 stating that fracking industry heads treated their opponents as if “dealing with an insurgency” with similarities to the military occupations which secure energy interests in the Middle East. Earth First! is an international radical environmental movement which began in 1979. The movement also publishes a quarterly magazine and daily online news wire as a mouthpiece for ecological resistance efforts worldwide.